I’ve been thinking about the Gospel reading from Chapter 10 of Luke, where Jesus tells the parable of the good Samaritan. In this story Jesus tells us to love our neighbors. When asked “Who is my neighbor?” he tells the story of a man who was robbed, beaten and left for dead on the side of the road. 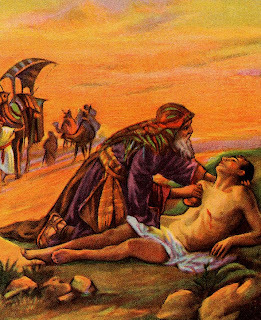 A priest and a Levite walk right by without helping him, but a kind Samaritan man gives him assistance. I didn’t spend a whole lot of time pondering the reading since the message is so straightforward. Good point, I agree that it’s horrible that the priest and the Levite didn’t help the man. Not much more to say. Though I didn’t consciously think through it, in the back of my mind I’d categorized the characters who walked by the ailing man as entirely different from myself — I might not be a saint, but I’m certainly not a “bad person” like these fictional characters. I’d never do anything like that! So it piqued my interest when our priest said in his homily that he imagines that these two men were not really bad people, that they were perhaps like a lot of us. How on earth could that be? I wondered. Certainly I would never be so callous, and I assume the same could be said for the majority of my fellow parishioners. Oooooh, boy. I think I might have actually gasped a little bit when I heard that. That one statement brought to the surface something I’d been thinking about — or, really, trying not to think about — a lot lately: how very often I use “I’m too busy” as an excuse for not making my stated priorities my actual priorities. Like all good lies, it’s based on truth — I really am busy. I honestly don’t have time to do it all, to undertake every charitable act that comes to mind, to pray for hours each day, etc. But yet, I’ve allowed “I’m too busy” to become a sort of mantra, a plausible sounding knee-jerk reaction to gloss over those times when I’m just too lazy or too tired or too distracted or too stuck in a rut to do the right thing. And hearing the story from so long ago, realizing that these men were probably not unlike me at all — that they were probably just people overwhelmed by their to-do lists and running late for somewhere they needed to be — makes me wonder how many times I’ve done the same thing. Could anything they had going on possibly be more important than lending a hand to that poor man on the side of the road? Doubt it. And I turn the question to myself: next time I casually blow off an opportunity to help someone in need, or just give a friendly phone call to a loved one, or to grow closer to God, on the grounds that “I’m too busy, ” I should think of this parable, and remember that the priest and the Levite were busy too. Like you, I thought this parable is straight forward. Then I read Father Frank Pavone’s take on it. The road was a dangerous one, and the robbers could be lurking around the next bend in the road. Those who passed by probably thought “what will happen to me if I stop to help this man?” and, perhaps out of fear, they passed by. But the Good Samaritan changed the question; instead he asked “what will happen to him if I don’t help him?” and that makes all the difference. is actually quite useless..while most assuredly neglecting some wonderful works of mercy not to mention prayer time..to which I respond but I already am engaged in a goodly number of works..
Then I remember that mindless surfing is a type of tranquilizer..which interferes with the Spirit for sure. a Sunday catch up session…since I have not missed it and the ” lost information” does not seem to have had any deleterious effect on my daily functioning!!!! My only concern it with what will I replace it.. one would hope deeds such as the ones you mention.. and quite possibly more chapel visits? Living in an urban environment, I feel confronted with much more similar situations to that of the good Samaritan on a regular basis, in the form of the homeless, perhaps not beaten and dying, but lying, likely sick, on the side of the road. And I tend to ignore them, like everyone else, but very much unlike the good Samaritan. The priest and the Levite could have had very valid hesitations – that got in the way of doing the right thing. This is SUCH a great post, Jennifer. And so true. I think your priest was right. Your thoughts reminded me immediately of the first time I was ever in New York City. I was in high school, traveling with my parents. As we were walking around, my dad noticed a woman lying–passed out–across the sidewalk. People were literally stepping over her to get where they were going. My dad couldn’t find anyone to help, so he went around the corner to find a doorman. The doorman peeked around the corner, looked at the lady, and said, “That’s not my building.” My mom, sisters, and I were ready to give up, asking my dad to please leave it alone and come on, but he would not. He just said, “We can’t just leave her here.” Finally, an ambulance came down the street, stopping about a block away. My dad ran over to it, pointed to the woman (I think they were looking for her) and waited until she was loaded into the ambulance before we could continue on. That example of simple compassion has stayed with me all my life, and I love my dad all the more because of it. I’m a new reader, but I loved this post. Lately, I’ve been thinking about the same thing. My daughter is 5 and I find the time slipping away. Too often I’m not taking the time to do the very things I swore I would make time to do; read to her, pray with her, talk intimately with her. It is not even strangers that we are “too busy for” but the very people we are supposed to be making time for. I had been taught that like many parables, this one can be understood on a number of levels. One level requires us to consider who the players are. The priest and the Levite are members of the temple, the official church; sort of like a deacon and a religious education instructor. The Samaritan is an outcast, unwelcome in the temple as a member of a heretical group. The priest and the levite may not be busy at all, but are on their way to the temple and are worried about getting blood on their hands and clothing. If so they would be ritually unclean and would have to go all the way home to wash and change before entering the temple. Jesus is making a point about the elevation of form over substance. He is pointing out that these otherwise good men are so bent on seeking God in the temple they are ignoring the true temple of God which is lying on the road bleeding. This viewpoint is of great value to me when I begin to judge others who don’t go to church often and don’t learn much about the faith. I have to remember that the Samaritan didn’t go to church either. It’s ironic that the priest and the Levite are actually spiritual leaders. It’s sort of a like an refugee in the US stopping to take care of the needs of a middle-class American while the church walks on by with our long list of things to do for God taking priority over human life.